My pattern (Simplicity 100) is quite a small size (32″ bust, 34″ hips). While I anticipated the fit at the shoulder and neckline would be fine, ease, styling and other factors often mean a pattern will make up bigger than you think. I carefully measured the actual pattern pieces, as I invariably do. In this case I was happy with the girth of the shoulders, upper chest, bust, and waist. However the hips appeared (and should have been) too small. By several inches. 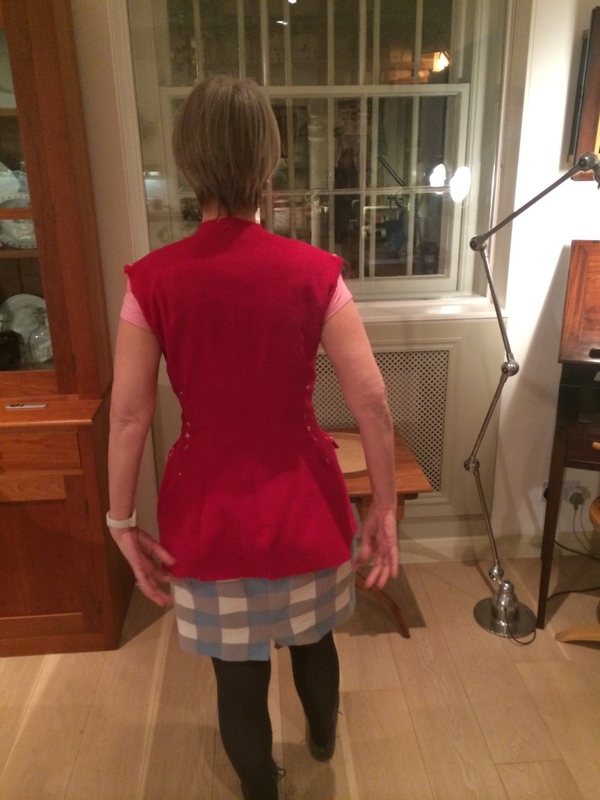 I therefore added additional width at the lower part of the jacket (below the waist line), adding a total of four inches across the back hip. This jacket has eight separate bodice pieces; therefore there are seven seams where the fit can be adjusted. It also has four darts which can be altered. Before constructing the toile I thought about how best to check the fit. Often I machine baste a garment together and just try it on. But because the pockets are part of the design and an integral part of the construction I needed to make them up first. So I made up the front pockets, darts and seams, pressing as I went. Then, instead of stitching in the interfacing and making the button holes I basted the facings by hand ready for fitting. I thought I might need to move the CF slightly if the neckline or bust was too tight. I then made up the four back sections and pressed them. I stitched up the shoulder seams and trimmed the interfacing. I machine basted the side seams, and pressed lightly, in order to try the jacket on for size. Overall I was pleased with the fit (despite my blank look), especially at the (unaltered) front. The waist is in the right place, although it maybe a little bit tight, and the darts work well. The pocket looks nice and opens just a little, as intended. There may be an issue across the upper chest, but I can’t be sure until I get to the sleeves. If this problem ends up materialising I may be in trouble, but right now the jacket feels comfortable ie not too small. But now let’s look at the back – where I added the extra four inches. What do you think? It’s way too much, isn’t it? I added twice as much extra ease than I should have done. It fits pretty well in the upper back, and once the sleeves are in I think the shoulders will be fine. 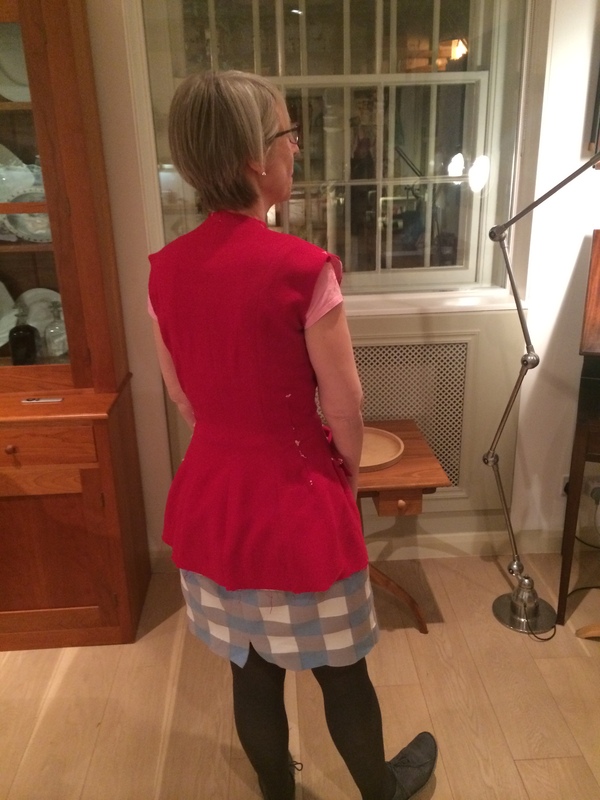 However I will share another back view in the interests of fitting science – it is a bit of a shocker. does my jacket look big? Although I am annoyed that I added too much width, this is an easy problem to fix. I will reduce the back seams by about half an inch below the waist at the back and trim the pattern pieces down to pretty close to how they started. I am surprised how good the fit is. All I can think is that the jacket had quite a lot of ease overall, for wearing over a sweater, and more at the hip in order to skim the tweedy, pleated skirt. However if I had 34 inch hips I think I would be swimming in this jacket. But, making a fitted jacket, and one with so many seams and details, is really hard. Every time you fiddle with the fit you risk creating a problem elsewhere. While it is nice to wear a jacket that “fits like a glove” that means it has to fit at so many different points that it can take ages to get the toile just right. And fitting yourself is almost impossible (these photos are how I see myself from behind). My next step is to finish the bodice, including the button holes and then add the collar. Then I will review my work. So far so good Kate. I think it will fit great, once you reduce the lower back. (better to be too big then too small). My fingers are crossed for you……its going to be a lovely jacket, and a fabulous addition to your wardrobe. Excellent , as always . The front is looking good. Well done on the pockets, Kate! The back view is not too bad, you can always take in the extra flare. All in all, a very promising toile. Are you going to have some shoulder pads? Yes, doing a fitting for yourself is tricky. One solution I have found is to prop up your iPad/computer/phone and using the front camera (like you would for Skype) record yourself on video. Then you can have a 3D view of yourself. Thank you, and great suggestion – video fitting. And yes shoulder pads are go! I will pin them in when I fit the sleeves. 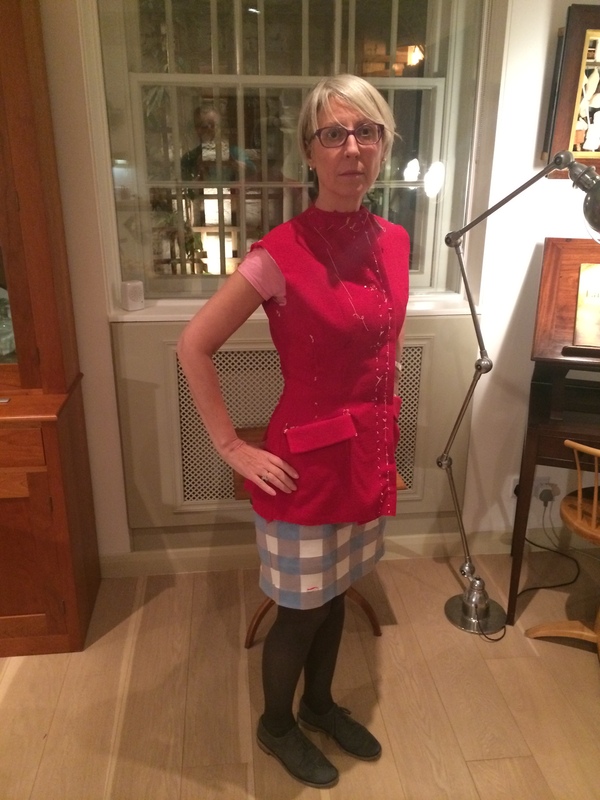 Thanks Mrs M. I have put in the sleeves and, yes, you are right – the fullness around the shoulder is needed. I have put some sleeve support wadding in, and I think it is OK. Will post when its finished. And I love the Pulling a Gloria point! I will have to look her up and see what you mean, but I know quite a few women who seem to be pulling their cardigans or jackets together all the time.